Antimicrobial soaps are usually based on chlorhexidine digluconate, povidone iodine, triclosan, benzalkonium chloride, DDAC, octenidine dihydrochloride, polihexanide or sodium hypochlorite. Evidence for a health benefit is inconsistent. Routine antiseptic body washing of ICU patients seems to prevent catheter-associated bloodstream infection, and bundles including antiseptic body washes on MRSA carriers can reduce transmission or infection. Benzalkonium chloride, triclosan, chlorhexidine digluconate and DDAC can cause a strong and often stable MIC increase, mainly in Gram-negative bacterial species. Cross-tolerance is frequently found between benzalkonium chloride, triclosan and chlorhexidine digluconate and also to selected antibiotics in some species. Horizontal gene transfer can be induced by chlorhexidine digluconate and triclosan in E. coli. Antibiotic resistance gene expression can be increased by chlorhexidine digluconate in a vanA E. faecium. Efflux pump genes can be up-regulated in some species by benzalkonium chloride and chlorhexidine digluconate. The lowest adaptive reaction is found with povidone iodine, sodium hypochlorite, octenidine dihydrochloride and polihexanide. 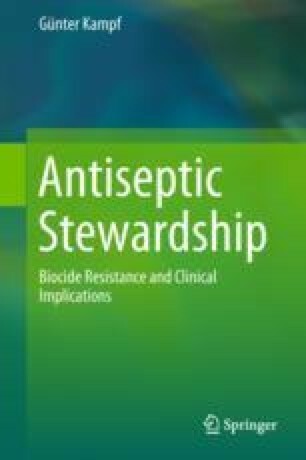 Use of antimicrobial soaps based on benzalkonium chloride, triclosan, chlorhexidine digluconate and DDAC should be restricted to applications with an expectable health benefit and not be used for routine hand washing at home, for surgical scrubbing (preference for alcohol-based hand rubs without selection pressure) and hygienic hand wash (preference for plain soap).